Continuing the debate, there are some questions I really don't know the answer to! As fascinating as it would be to research curly hair in depth, scientists really aren't that interested. Some questions that are thrown at me I have no answer to. Here is one and just a forewarning, I chose to be controversial on this one! 5. Bun up my hair when it gets to shoulder length to stop the ends rubbing against my clothes. I think you are doing too much. Perhaps it is time to get some nice hair accessories and simply keep your hair off your shoulders. If your hair is type 4, you can probably style it to appear shorter than it is. I cannot emphasise how much patience it takes to grow hair longer. You have to find a simple routine that works and you have to wait. The fact that your hair is thicker is an indication that you hair is growing. Now over to you, what would you advise Tejuana? 1. What do you regard as the ends of your hair? My view is anything more than 4 inches away from the scalp is regarded as an end. 2. Is roller setting the ends of your hair useful? I am not certain that roller setting is anything more than a styling technique. 4.Twists or braids as a protective style? This is probably only useful if you can put them in gently and keep them for a long enough time to make a difference (2-3 weeks in my opinion). Otherwise, save yourself the time and get a hair clip. 5. Hair off the shoulders? I like this idea. However, if your hair is not long enough to get into a bun then you will probably end up just needlessly stretching your hair. Banana clips and claw clips are good alternatives. 6. Heat train hair? Argh, you don't want me to get up on my soap box! I have not heard this term for a while. I actually heard it from one of my Indian Kenyan friends. She flat ironed her hair with some oil regularly (upto 3 times a week) to attempt to get rid of the wave in her hair. Scientifically this means use either regular application or high heat to break the bonds in hair. Is this damage? Yes. Is it permanent? Highly likely. Will my hair break? It depends, some people like my friend just had super dry hair after but she still had hair. Others may not be so lucky. I am not saying don't flat iron your hair or don't blowdry it but I am saying that too much or too often can kill the curls. Ok I'm off my soap box and you may have it! Thanks Tejuana for contributing and for allowing me to give a lecture lol. I agree with everything your said Jc. Growing (natural) hair takes patience. We wanted it yesterday but we just have to wait and as long as we are taking good care of our hair, it will come. Heat training is an option only if you don't mind killing your curl pattern. If you're fine with that then ok.
Nice post. 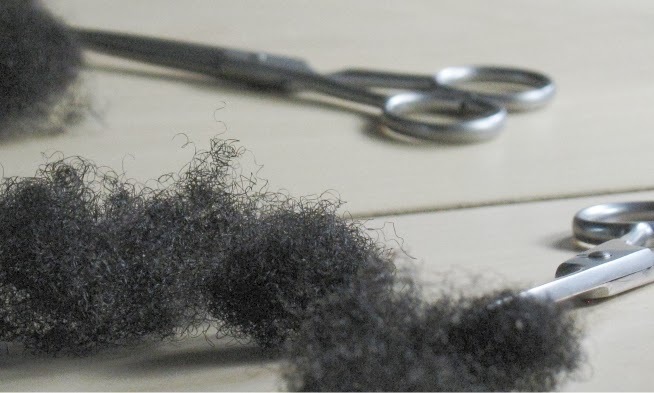 Gives you a few things to ponder about protective styling. 1.) Sorry, that heat training mumbo jumbo is utter nonsense. It is terribly easy to damage the hair with heat (even if you're taking all the proper precautions). The simple act of doing this is probably why she is not retaining any length. 2.) As far as roller setting, I think it depends on the hair and the type of rollers used (those 2 piece plastic rollers can break off your ends if you're not careful). I personally found that roller setting makes my ends look scraggly, so I just twirl my ends with my fingers and a bit of oil. 3.) Bunning. I wear my hair out (in a twistout) 95% of the time and my hair is growing like wild fire. I used to bun all the time out of sheer laziness, but I found wearing my hair pulled back into any sort or "protective" style for any extended period of time (ie. more than a week) led to breakage and thinning around my hair line (no matter how loose I made the bun or pony). I don't have that problem now that I wear my hair out most of the time. I believe following as simple a routine as possible is the best way to grow out your hair. All the twisting, braiding, roller-setting, and heat-styling cause quite a bit of wear on the hair which I think might lead to breakage. Right now, I keep my APL hair off my shoulders, (unless for special occasions), conditon often, moisturise every night, shea butter on the ends and pull it back loosely. I think doing too much to your hair will just stress it out. I think this is one of those situations where you have to figure out what's right for yourself. For example- for ME, wearing my hair loose is just not a great daily option. This includes twistouts, braid outs and wash-n-gos. My hair gets very tangly and dry. For me, loose hair is for special occasions. Otherwise, I'm braided and bunned. It keeps my hair soft and tangle-free. And as a result I have very few knots and little breakage. But youve gotta find a healthy balance that works for your head. If you think you're overmanipulating then try to manipulate your hair less frequently and see how it goes. Good luck. Her hair should be longer even if natural hair takes patience. At least 1 inch every 4 mth if not she is doing something wrong sure. To my mind she manipulates too muuuuuch. As for the heat ...Oh boy! It seems best to K.I.S.S. As for keeping hair off your shoulders, it's a lose-lose situation for most people, including myself. You're either going to damage/thin your hairline by pony-tailing your hair up, or you're going to thin your ends by leaving your hair down and letting it rub against your shoulders. Anyway, I've digressed MASSIVELY. I only meant to ask if I really need to protective style as my hair grows fast and doesn't get damaged too easily. I don't like protective styles and like my hair to be free. So, will it be okay if I look after it and just get it trimmed when I see split ends/damage? And continue using natural products and no heat? It's grown kind of long before without me knowing what I was doing with it. Anon - wearing your hair in a lose ponytail is not an issue. If your hair cannot easily get into a ponytail then there is no need to. Hi Carmen - Protective styling works for those who find it hard to retain length when hair is loose. Therefore someone like yourself who has no issues with length retention does not need to protective style at all! For biracial hair I really recommend Teri's website (tightlycurly.com). I also think you can look at OKDani.com - She has a looser curl and you definitely should look at the naturally curly forums - naturallycurly.com plenty of type 3s over there!